ArabSaga: Is Lebanon going Iraq’s way? Booby-traps continue to be planted in Lebanon’s fragile frame. The frame’s rattled and exposed contours are exposed to internal and external storms. What remains of the State is shaking and eroding. The “Lebanese arena” is being invited to commit suicide. And some want this to happen without delay. I don’t claim the Lebanese to be innocent, or simply victims. Divisions are profound. The number of adventurers is high and relations between the component elements are at their rock bottom. The beleaguered country’s president received a letter from King Abdullah bin Abdulaziz urging him to act quickly to prevent the fire breaking out and to beware of its likely triggers. Lebanese leaders need to diligently scrutinize the lines in the letter and read what is between them. The author of the letter had previously sponsored the sole attempt to prevent Lebanon from falling into the abyss. His efforts at the time were code-named “S-S” (for Saudi-Syrian mediation). Shooting down that initiative battered Lebanon as well as Syria’s Arab and international relations. Had those efforts succeeded, Beirut would not have been twisting and turning today to the tune of sectarian sensitivities. Perhaps Damascus too would have been less agitated. It is an open secret that happenings in Syria are beyond Lebanon’s staying power. Damages were expected. But the shock was the speed of Lebanon’s loss of cohesion and its total lack of immunity. Decadence of the State augurs dire consequences. 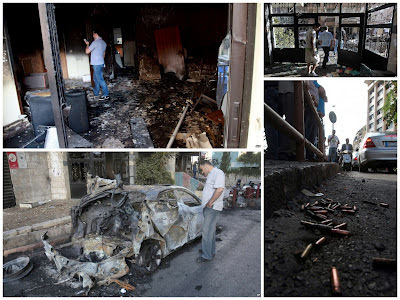 A serious incident, such as the killing of two Sunnite sheikhs in Akkar, nearly ignited an inferno. A serious incident, such as the abduction of Lebanese Shiite men in Aleppo, all but sparked a fire as well. Luckily, ex-premier Saad Hariri reacted prudently and responsibly to the first incident. And (Hezbollah leader) Sayyed Hassan Nasrallah was quick to contain reactions to the latter. The initiative to prevent the conflagration is not enough. The country is falling apart and so is the region. You only need to look at Iraq. The example there is vivid and blatant. Some people believe Syria’s own components are also sliding into a bloody and long crisis that can only end à la Iraq. Without necessarily using official parlance about federalism and provinces, this would have a traumatic impact on Lebanon, the quasi-makeup of which translates into civil war each time the balance of power between its provinces swings one way or the other. After the infamous Akkar incident, and irrespective of its circumstances, the military institution got embroiled in the Lebanese dispersal. Voices were heard accusing the army of establishing a symbolic presence in one province and of seeking to impose its clout in another. It was accused of coexisting with armed citizens in the first and trying to disarm citizens in another. That’s a sequel of the Sunnite-Shiite split over the “Resistance’s weapons,” which to most Sunnites are Hezbollah’s weapons. It involved thinning out Lebanese military forces in one province and redeploying them in a weaker province, where power is divided between Michel Aoun and Samir Geagea. Tragedy does not lie in countries being weak, governments being ineffectual, or parliaments being impotent. Tragedy rather lies in discovering the maps are ailing and the provinces therein are demanding new labels and recognitions. The reasons are the setback to co-existence resulting from tyranny and the lack of a culture of recognizing the other side and its right to disagree. Experience shows manipulating maps is costly and delineating provinces in them is fraught with funerals, displacements and abuses. Lebanon’s map is also ailing and the national fabric is worn out. Careful appraisal shows a solemn Lebanese State would spare the Shiites a horrific crash, the Sunnites a costly gamble and the Christians further exodus. The choice is evident: either a return from the mentality of provinces to the mindset of a State or drowning in sectarian flare-ups and protracted wars.